Men’s skin are not as complex as females, but they still have problems. Acne is sure to start appearing when you reach puberty, or even way past puberty. Genes do play a huge role in if you get skin problems or not, but you cant blame it all on genes. Because things like diet, using the right products and exercise also matter. From my experience, out of puberty and into my young adult age. I saw the biggest change in my skin problems if I fixed my diet. Using good products did help but diet is the biggest factor if you wanna improve your skin conditions. But using Skincare products have their benefits if used correctly. 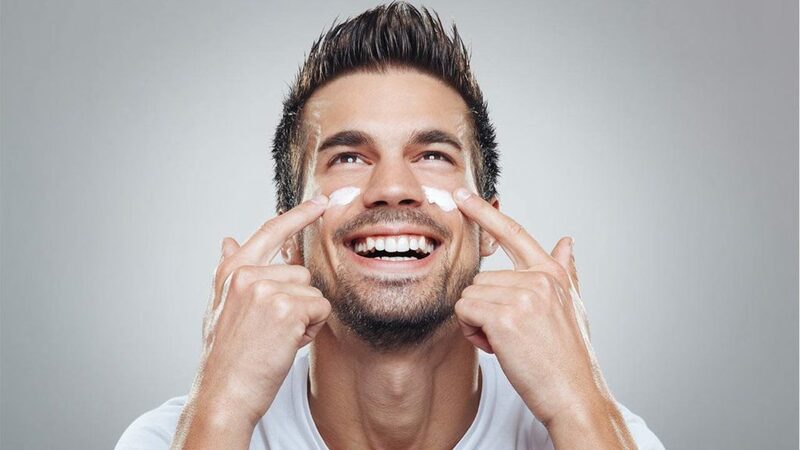 We have collected the top ten best male skincare products so you can treat your skin problems. First thing to know about using skincare products is that you don’t want to abuse them. You really cant just throw everything at your face or skin, and expect it to improve. You will need to create a routine on when to use a product and when to use the other products. Sticking to this routine is key, it doesn’t matter if you still don’t see any improvement in a week. At least stick to the routine for a month and see if you don’t see any improvement then it would be best to change it up. The skincare products you should use depend on your skin condition. But there is a general idea like a face wash, moisturizer,facial scrub and body lotion. These are just generally what someone might need to maintain a good skin health. Using a face wash is necessary, you might need to use it more than once a day but once is necessary. What to look for in face washes depends if you have acne. Or if you have oily or dry skin. If you do have acne a face wash with benzoyl peroxide and salicylic acid will kill bacteria on your face. But if you have dry skin you will need to find a hydrating wash, if oily you will need to find a oil maintaining wash.
Moisturizing is key after washing your face, because all of the oils and moisture from your face will be lost after washing it. So a moisturizer will help maintain moisture and over oiling the face. A facial scrub on the other hand also will depend on your condition. Is your face dry, oily or normal, you will need to buy something regarding that. The use of facial scrub is 3 times a week is more than enough. I use a scrub Monday, Wednesday and Friday but your routine can be different. Body lotions are key to deal with body acne or just keeping it moisturized and healthy. The thing to look for in body lotions is shea or cocoa butter. And any essential oils such as tree tea oil. The Tiege Hanley skincare system provides one of the best routine to maintain good face condition. It doesn’t overly attack some problem nor does it hold back. It just does everything and with 4 products in one buy you wont need to look for multiple products. They also give a helping paper that has everything you will need, like how much to use certain products or when to use them. Since setting up in London’s Covent Garden 35 years back, Neal’s Yard has constructed an outstanding notoriety for skincare items that burst with every one of the supplements and concentrate that Mother Earth brings to the table. This night cream is a for example, packing a punch with its nutrient rich mix of avocado, almond and wheatgerm oils. Numerous night creams neglect to convey on their guarantees, yet specialists in the field say Vitamin E is one fixing that it merits applying to the skin before rest. By stopping any sun harm that may have been activated amid the day, there’s solid proof an item like this can keep the development of new wrinkles. It leaves skin feeling sleek and lavishly sustained with a solid suppleness that increments with utilize. Brickell’s Men’s Purifying Charcoal Face Wash it cleans your face, much the same as a bar of cleanser, yet does as such while delicately removing oil and bacteria without aggravating or drying out your skin. Charcoal is useful for the skin since toxins stick to it to give profound purging and detoxification. Another reason we incorporated the Purifying Charcoal Face Wash on our rundown of best men’s skincare product is that it’s appropriate for men of all facial skin types. In addition, the green tea and basic oils go about as a skin toner, which makes it an incredible multi-reason purpose wash. Rugged & Dapper’s Face Moisturizer for Men is one such product and delivers in a variety of ways: it moisturizes, protects the skin against post-shave irritation, it helps reduce and eliminate signs of aging such as fine lines and wrinkles, and provide protection against harsh weather and damage due to excess exposure to the sun. Like the thin layer of skin on the lips, the zone around your eyes ought to be given additional consideration, particularly when subject to cool climate. Also, with a similar certainty that February pursues January, maturing plagues every one of us. Fight off both the chilly and indications of propelling a long time with this cream. Rye seed separate, incredible at firming and smoothing skin, omega 3-rich linseed concentrate and caffeine, which diminishes puffiness, join to make this a winner worth its price. A touch two times per day will battle crows’ feet and dark rings. First thing to say about Humane Benzoyl’s 10% Acne Treatment is that it’s strong stuff. Really strong. Strong enough that you shouldn’t use it if you have sensitive skin. And strong is a necessary thing to have while fighting acne. Humane’s Benzoyl Peroxide treatment treats acne on the face, body, and back. Brickell’s Renewing Face Scrub For Men is a true exfoliator in the sense of the word because it contains pumice. And pumice’s main purpose is to remove dead skin cells, which is what the exfoliation process is all about. The Renewing Face Scrub For Men handles the diligent work of gathering up dead skin, abundance oil, and other facial pollutions removing them without drying out your skin. Rather, it leaves skin feeling delicate and your complexion clear because of common cleaning particles. Jojoba beads and pumice while different ingredients, for example, aloe vera support the skin. Dr Jackson is another brand that shows the best of natural ingredients. This moisturising oil containshe oils of baobab seeds, marula seed, calendula flower and arnica and is a versatile little thing. Apply straight to the face, massage through the hair or rub it after shaving it does it all. Lubriderm is known to make amazing products for women. But some say this lotion is better than any woman product. Like we said men skin is different from women’s so they need a collage booster which this product provides, It can be used a face lotion or body lotion. It’s also lightweight, fast-absorbing, and non-greasy. Nivea has since quite a while ago conveyed solid skincare alternatives at great esteem. Its Active Energy Fresh Look Face Wash Gel is the nearest the brand has to an “excellent item”, breaking out of the clear “wash” and “saturate” sections that characterize its item extend. A rich chemical, this face wash contains the key nutrients expected to recharge climate worn skin alongside peeling fixings to strip dead cells and unblock pores. Washed down, tick; invigorated, tick. YouTube Got Hacked – But Who Is Behind The Hacking? ?